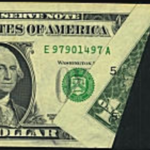 Three Dollar gold pieces were authorized and minted to facilitate the purchase of 3c stamps in sheets of 100. 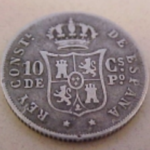 They were not very popular and as a result, were struck in small quantities between 1854 and 1889. 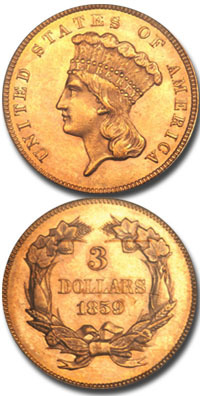 The design features a head of Liberty in a feathered headdress, while the reverse has the date and the number “3” and the word “DOLLARS” encircled by a wreath. The mint mark, if any, can be found just below the wreath. All Three Dollar Gold pieces are scarce, with only the 1854, 1874 or 1878 being seen with any frequency due to their higher mintage. 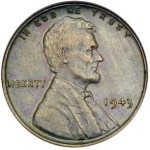 Even these dates are worth $600 or more in average condition, with uncirculated examples worth over $2000. Other dates in the series range from very rare to extremely rare, with one date, the 1870-S, having only one specimen known to exist. The Four Dollar Gold Piece or Stella is a pattern coin, which is a coin made as an example of a proposed coin. There are two very different looking types made in both 1879 and 1880. Charles Barber designed one with a Liberty head with flowing hair and George Morgan designed one with a Liberty head with coiled hair. 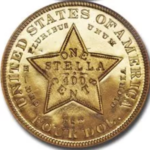 Both types have a common reverse, that is a star with the words “One Stella-400 cents.” The minting of both these “patterns” took on the air of a competition between the two designers as they solicited Members of Congress with examples of their designs. 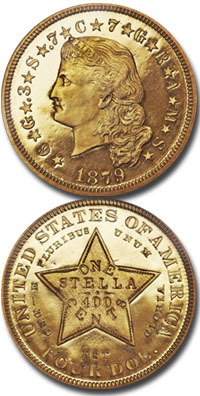 Stellas are very rare today, with the highest mintage being 415 pieces for the 1879 Flowing Hair piece. 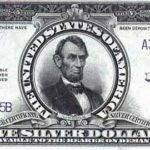 They were all struck as proofs and none were placed in circulation so most pieces encountered today are usually in a high state of preservation. Stellas are worth more than $100,000.